Have you tried our new Espresso Bar? The New Deal Cafe serves an accessible, plant-based, Italian-American menu that nurtures the environment, animals, and our health. Delicious house-made plant-based Italian-American cuisine! Sample our gourmet wine selection, or kick back with a cold beer and free wifi. Dine with us before your live theater experience across the plaza at the Greenbelt Arts Center, or nip in for a nightcap afterward. Take in a movie in the historic theater across the square, and join us for dinner. Ample FREE parking! Enjoy live music six nights a week in an intimate community atmosphere. 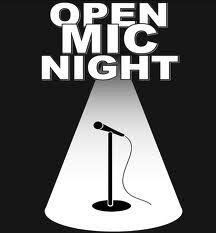 Open Mic every Tuesday from 7 to 10pm!! New Deal Open Mic with Michael McTrouserpants - sign-ups begin at 6:30 pm. Performers will typically have 3 songs or fifteen minutes on the stage. 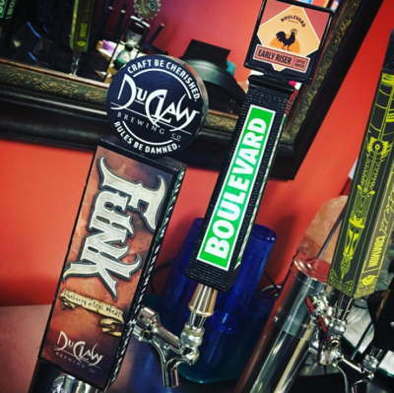 Enjoy our rotating selections of micro-brewed draft beer, bottled beer & international wine! Happy Hour is 4pm to 7pm Tuesday through Friday! Love the cafe? Now you can wear it! Our Zazzle shop is stocked with shirts and onesies, drink coasters, notebooks, cards, and wrapping paper sporting the classic New Deal Cafe logo! Nestled in historic Roosevelt Center in the heart of Old Greenbelt, the New Deal Cafe is the perfect spot to catch up friends or watch the world wander by. Coming from out of town? See our driving directions. We suggest reservations on weekends after 6pm. To help us keep bringing you great music and live events, please take note: reservations are for customers intending to order a meal, are accepted until 8:30pm, and are held for twenty minutes. Reservations may not be confirmed until the next day. Same-day reservations are taken by phone only. Questions? Call (301) 474-5642. The Friends of New Deal Cafe Arts sponsor art exhibits, poetry, and festivals at the cafe. Find out more about how you can support local arts. Sign up to receive news about the cafe!